Our expedition to China was rewarding and successful, and all our goals were achieved. our way up dried river beds and camped in the company of coyotes. We visited a 10thC Tibetan Fort and a 11thC Mongolian fort. We visited many historic sites and ancient Buddhist shrines. And we basked in the wind-blown splendour of the Gobi dunes. In the far north of China, the Great Wall stretches away into the Gobi Desert. North of this lies the garrison town of Khara Khoto. This was a military fort on the Mongolian border and dates back to 1032 AD. The region is known as Inner Mongolia. The word 'Inner' springs from the Sino-centric perspective where 'inner' was nearest, and 'outer' was furthest from Peking. Genghis Khan, the fearsome ruler of Outer Mongolia, captured the town in the year 1227 and established a military base there. It remained under Mongolian rule for 145 years. In 1372 Genghis Khan’s influence was on the wane and China’s new Ming Dynasty was exerting its authority. The great desert fort was protected by unassailable walls and maintained by a formidable army. A frontal attack was clearly impractical. So the Ming emperor marshalled a great force to dig a canal to divert the river - and the siege was set. The Mongol leader, Khara Bator, soon realised his fate. He dug a deep well which failed to supply water. Fearful of capture, he killed his own family before throwing his treasures down the well and running on his sword. The Chinese entered the town and slaughtered the occupants. They left the bodies unburied in the main square.The city was never reoccupied and gained a ghostly reputation. It became known as the ‘Black City’ and is shunned by the Chinese and Mongolians alike. The city was claimed by the desert sands and is now only distinguishable by it’s 30ft ramparts, crumbling temples and many bleached bones. Dr Raymond Bird and Kit Constable-Maxwell launched an expedition to visit this site in October 2009. They were accompanied by Philippa Treadwell and Suzan Rae, both experienced travellers. We flew to Beijing, took an internal flight to Kashgar and hired a 4x4 vehicle from the accomplished driver/guide Jian-Hu. We set out across the Taklamakan desert where our route was marked by 18,000ft peaks on one side and open desert on the other. We camped in the desert at Mazartag Fort. 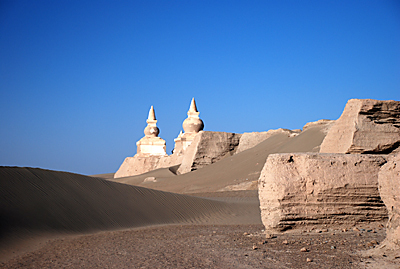 We followed the old Silk Road and reached the town of Dunhuang a week later. This renowned centre hosts Buddhist paintings and artefacts up to 1,000 years old. At the Mogao caves nearby, we visited many historic shrines at 'The Caves of a Thousand Buddhas'. From Dunhuang we made an excursion into the desert to visit a ‘Yardang’ formation, where numerous windblown troughs carve parallel corridors reaching far out into the sands. From here we travelled to the great Ming fort at Jaiyuguan, a memorable tribute to medieval tactical and architectural skills. A week later we reached Khara Khoto where we entered the city walls, and trod the sacrificial sands of medieval history. Our visit was the grand finale to our long planned and long travelled journey. We strolled through the abandoned fortifications, climbed the drifting sands and revered the hesitant history of this great border town. We continued to Beijing and took an air flight back home. We returned to UK in early November. A full website article will follow and a lecture is in the course of preparation.